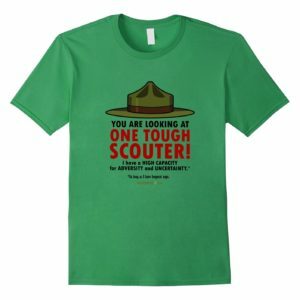 When the board of review has approved his advancement, the Scout deserves recognition as soon as possible. 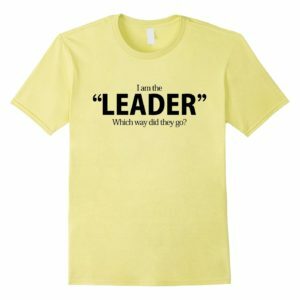 This should be done at a ceremony at the next unit meeting. His achievement may be recognized again later, during a formal court of honor. Immediate recognition is a powerful incentive of the BSA’s advancement program. A Scout should receive his new badge as soon as possible after his achievement has been certified by a board of review. 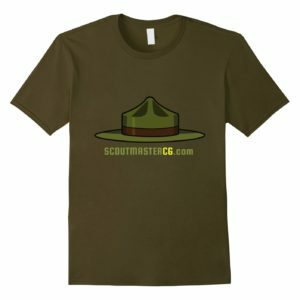 A simple ceremony at the conclusion of a troop meeting or during a campout is ideal, with the Scoutmaster making the presentation of the badge. Courts of honor may be chaired by the head of the troop committee or the troop committee member responsible for advancement. The planning of the program also should be handled by these individuals, along with other members of their committees. Publish the dates for courts of honor in the troop calendar. Promote an upcoming court of honor throughout the troop. Have all awards on hand and certificates signed well in advance of the event. Ensure that the meeting place is appropriate and properly set up. Consider outdoor locations, weather permitting. Use decorations and props that are fitting for the occasion. Make the ceremony dignified and meaningful, both for Scouts and for the audience. Consider serving refreshments afterward and providing adults and Scouts time to visit. Watch the time. Most courts of honor should last no longer than an hour. Why do we need to go to the trouble of having a court of honor? Ceremonies are important to the aims of Scouting by providing a definite, formal and meaningful recognition of what our Scouts have achieved. Including families and guests in the audience recognizes their contribution to and celebration of our Scout’s advancement and growth. 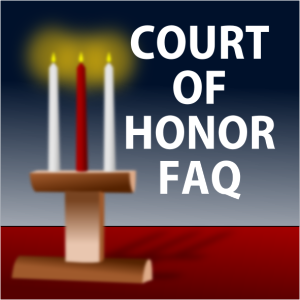 What is a “formal” court of honor? 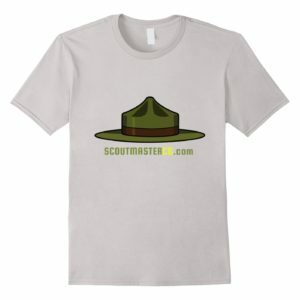 “Formal” is used to differentiate the court of honor (a ceremony with families, friends, and the public in attendance) from a less formal immediate recognition ceremony when a Scout is represented with his badge at a unit meeting (or, indeed as the Scoutmaster handbook mentions, during a camping trip). Can badges be presented outside of a court of honor? We should not be making Scouts wait for a court of honor before they receive badges of rank or merit badges that have been certified as completed. In the case of badges of rank the certification comes from the board of review, in the case of merit badges the certification is a completed ‘blue card’ or application for a merit badge. A Scout who has received a badge prior to a court of honor should still be formally recognized at the next court of honor. Some troops hold on to the certificate (a card) that accompanies the badge for presentation at the next court of honor. Is there an official court of honor script, rules, or procedures that must be followed? Every troop has their own traditions, and sometimes these traditions are misunderstood to be official policies or rules. 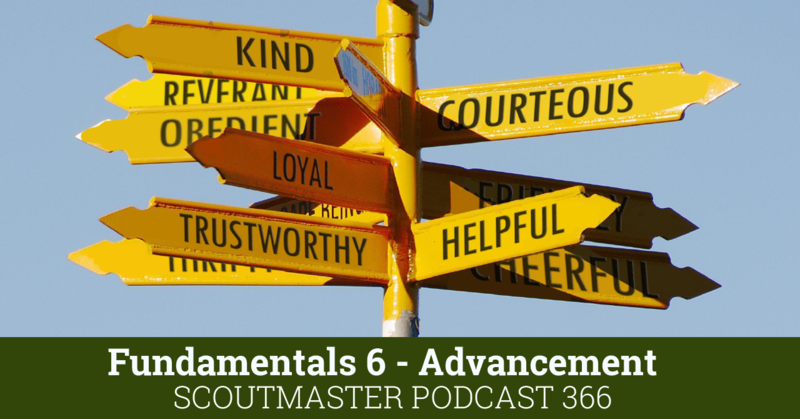 The quotations from the Guide to Advancement 2013 and the Scoutmaster’s Handbook above constitute all of the official advice and definition concerning courts of honor. Although suggested scripts for ceremonies are common there are no official court of honor Scripts. 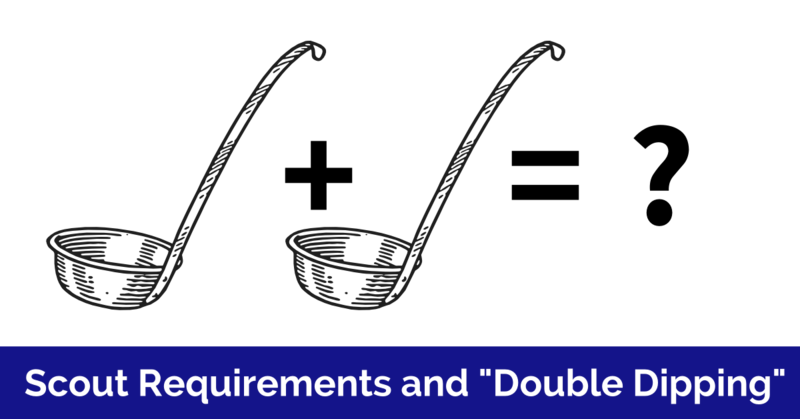 Are certain ceremonies or aspects of presentations specifically prohibited? As you can see the official advice and direction is positive rather than prohibitive. That being said it is understood that we will conduct courts of honor in accord with the principles and spirit of the Scout oath and law, and the policies and applicable procedures described in the Guide to Safe Scouting. In the context of ceremonies it’s especially important that we don’t permit hazing (rituals and other activities involving harassment, abuse or humiliation as initiations) during any Scouting activity. Must an Eagle court of honor be a totally separate ceremony? 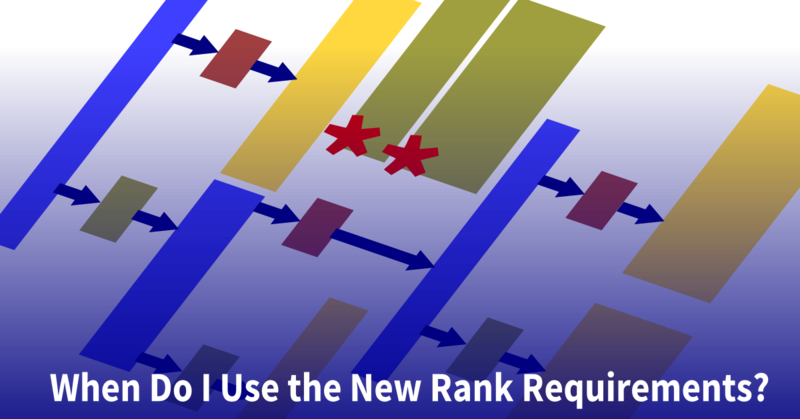 Eagle rank is the only rank that must be certified and approved by the National Council before it is presented formally, and the recognition should be commensurate with the honor of the achievement. 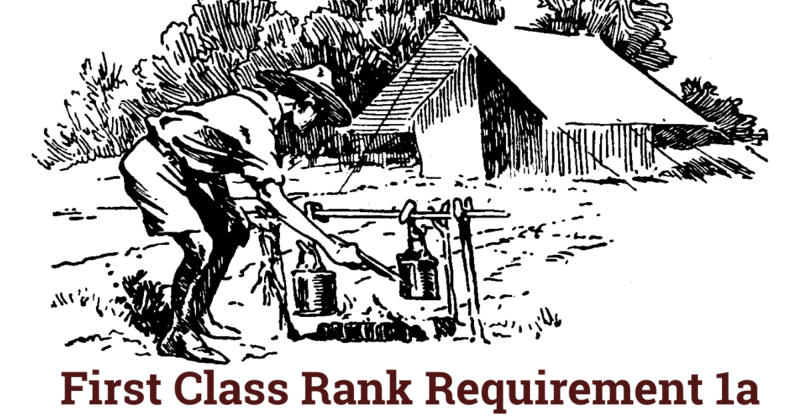 The Scoutmaster’s Handbook instructs us to formally present the Eagle rank in a ceremony separate from the “normal” troop court of honor. Why are our courts of honor poorly attended? They are likely too long or scheduled at a time that is inconvenient for families to attend. A court of honor, even for a large troop, should be brief and meaningful, (well under an hour in most cases). Extemporaneous remarks (more often than not made by adults) can add many minutes to the presentation. Comments or stories should be thought out and rehearsed beforehand, resist the urge to go ‘off the cuff’. Consider scheduling a quarterly parent’s night in exchange for a troop meeting when announcements and other information can be shared and conclude the evening with a court of honor. Why are our courts of honor are boring and/or our Scouts don’t adopt a respectful attitude during the ceremony? The Scouts themselves create or adapt a script for the ceremony. Familiar elements are included in every court of honor. The individuals presenting the ceremony have rehearsed their movements and what they will say. The court of honor lasts for a set time (well under an hour). Is the plural “court of honors” or “courts of honor”? The proper plural is “courts of honor” (and “boards of review”). Our smallish troop of 25 boys has their CoH twice a year, in the Fall (to cover mostly Summer Camp advancement) and in the Spring (for the “school year” advancements). The PLC plans it with help from the Advancement Chair and a scout (usually one working on the Communication Merit Badge!) acts a emcee. We award rank advancement badges immediately after the Board of Review, but hold off awarding Merit Badges until the CoH. We are usually able to cover all the advancement recognitions in under an hour. Regarding Eagle CoH, we let the boy decide what kind of ceremony to have (generally with parents’ input). Some are fine to have it as part of a regular CoH, others want a separate event. This plan works for us, encourage your troop to find a system that works for them. I have found quarterly Courts of Honor to be less and less meaningful over the years. 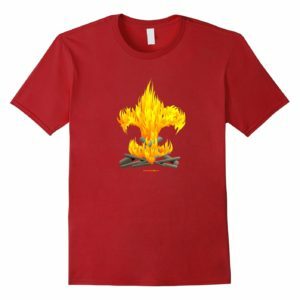 With immediate recognition of advancements and merit badges and separate Eagle Courts of Honor, the quarterly CoH has lost much of it’s meaning. Frankly, they end up being a lot of work for little benefit. Our Scouts get far more recognition and satisfaction from the receiving their awards immediately after earning them. Typically they are the “star of the show” as we rarely have more than one or two Scouts completing a rank the same night. The accomplishment is, in fact, news to the rest of the troop which genuinely and spontaneously applauds and congratulates the Scouts. Compare that to Courts of Honor which have become a rehashing of three-month-old news. There is nothing to physically present, so the SPL is left to call forward a Scout with no real purpose other than read a list of already-presented badges. It takes us about fifteen minutes to set up for a quarterly Court of Honor, and another fifteen or twenty to conduct them. They follow a quarterly parent’s meeting, and while they are reasonably formal, we don’t make them overblown or maudlin. At times I find them a little cloying and sometimes I downright dread doing them, but that’s more about having watched them for three decades than whats actually going on. What’s more important is that parents and Scouts enjoy them, and they become meaningful milestones for everyone involved, we’ve been pretty successful in doing that. If you conduct them as “rehashing three month old news” it’s little wonder you aren’t finding them particularly meaningful. Perhaps the question to ask is what changes would make them more meaningful? Um, no. I spent two hours week before last just cutting and pasting a TroopMaster report into a script which was readable by our SPL. I didn’t script the whole CoH — left that for the SPL to create — just provided him with a sensibly organized list of the 175 merit badges and 15 or so advancements our 55 Scouts earned at summer camp (and a few before and after). In fairness, the September CoH is includes many more awards than the others. Frankly, the two major changes which would make the quarterly CoHs more meaningful would be to eliminate the redundancy by dropping both immediate recognitions and separate Eagle CoHs. But that’s not happening as, noted above, the boys and their parents enjoy and appreciate both of those. Unfortunately, they have made the traditional CoH redundant and irrelevant. I think it is time we admit the traditional Court of Honor has gone the way of leggings and snakebite kits. I am all about trying different ideas, if the quarterly CofH is redundant for the way you are doing things do away with it, as you noted; it’s a “may” not a “must”. 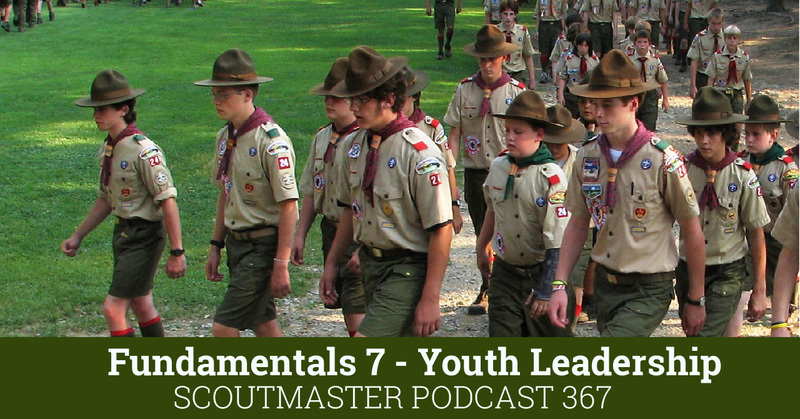 Whether it happens at a formal court of honor or at a troop meeting closing the point is taking the time to recognize the Scout in a way that is meaningful to them. It is pretty difficult to present nearly 200 badges without putting a few people to sleep, we have certainly gone through that before! Reminds me of our son’s college graduation with something like 800 graduates. We certainly changed the way we do Eagle Courts of Honor. When I started out they were pretty big affairs, and things just got out of hand. You may as well have planned the boys wedding or a royal coronation on the same day, folks were going a little crazy, complaining when not enough people showed up, and parents were feeling the pressure to put on a bigger show than the last one, etc. We reached the point where we had a catered reception with a band, (really, no kidding). We do up to two a year (spring and fall) for everyone who makes Eagle (usually 2-3 at a time) and make that our quarterly troop court of honor as well. We will do supplemental individual presentations if the Scout and his family wish, but in fifteen years no one has asked. So, obviously, big fancy courts of honor (or even quarterly ones) haven’t always been the rule. I’d say that many of my Eagle Scouts would have been happy (and relieved) to skip the court of honor altogether! As a matter of fact one or two did! NOW we’re on the same page. You’re not doing individual Eagle CoHs but incorporating them into the regular troop Court of Honor. That was the tradition in my troop as a youth which certainly gave the Courts of Honor more meaning and importance. Unfortunately, the tradition of our troop, since way before my time, is to conduct separate, individual Eagle CoHs which greatly take away from the quarterly CoH. Although I’ve suggested it numerous times, no one has been willing to forgo their big day. I think that the whole Eagle Court of Honor thing is seriously out of hand, but most folks seem to like it.